As part of Hasbro’s popular FurReal Friends category, JJ My Jumping Pug has to be one of the most amusing toys you’ve ever seen! By using the latest sensor technology, JJ can respond to waves of your hand with actions like jumping onto his hind legs from a sitting position! JJ can also get very excitable, although a pat on his head is guaranteed to calm him down. Full of electronic sounds and movements, there’s never a dull moment when he’s around. His big doleful eyes seem to be almost real as he shakes his head from side to side anticipating your next move. JJ My Jumping Pug is suitable for all kids aged 4 and over and is one of a large range of FurReal pets. Kids also love Trixie the Skateboarding Pup, Hop and Cuddle Bunnies as well as Walkin’ Puppies Pom Pom. 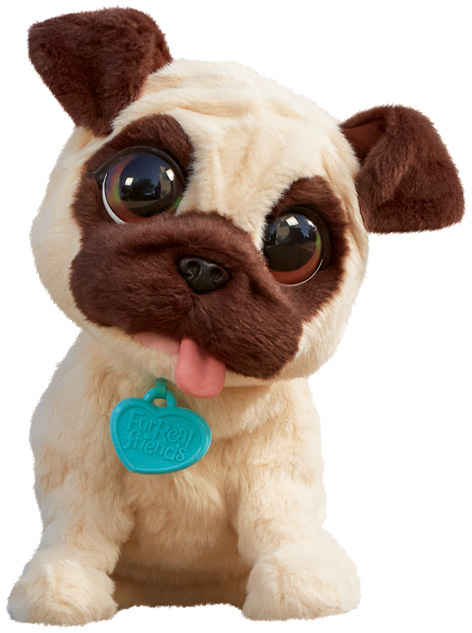 Please tell us what you think of JJ My Jumping Pug by FurReal Friends and Hasbro.